Calling all the parents around! We know how ordinary just doesn’t cuts it for kids these days. So here’s introducing to you a one stop shop for all the fun and frolic that toddlers will surely love. Let'emplay is a children’s entertainment zone in MGF Metropolitan Mall, Saket, with a play arena, Trampoline Park, Foam Pit, Drop Slide, Snack Shack and other exciting activities. Don’t let boredom and technology addiction get to your kids. This 6,000 sq. ft. zone is a child’s dream come true–let them defy gravity with huge leaps and bounds on the trampoline or roll and hop in the foam pit. This one’s just perfect for all from 6 months to 15 year olds and lets them go wild on creativity, imagination, physical activity and meeting new friends amidst a completely safe, colorful and innovative play zone. Let the kids grow mentally as well as socially, playing in a carefree space, helping them develop psycho-semantic skills. See how the little ones develop their power of observation, critical thinking and creating memories for a long time, exploring the peak of their energy levels. 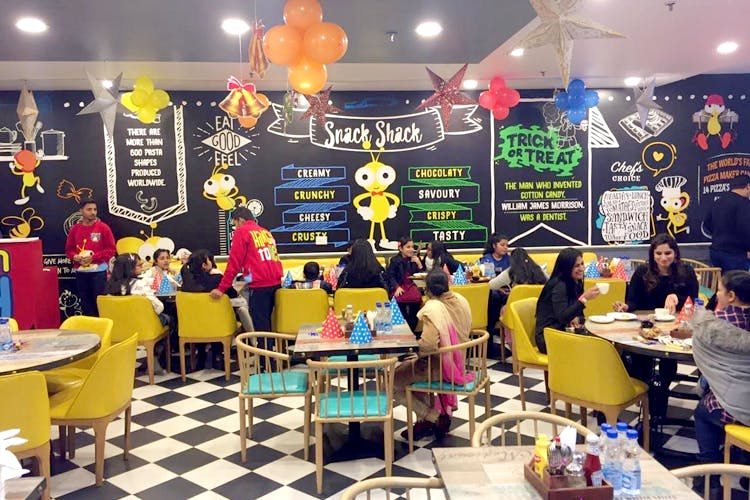 Once they’re done with all the jumping around, no need to worry about those hunger pangs as the gourmet hangout, Snack Shack is where you’ll want to flock to for some foodie indulgence. With options to choose from Corn Cheese Balls, Load up Nachos, Pizzas, Egg Station, Pastas and many more scrumptious delicacies, it’s gonna be the numero uno choice for them all. The fact that the play zone is located in the mall itself is such a bonus! Just drop them for a day full of excitement as you shop your hearts out in the sale season. Don’t need no bother about constant questions by the kids! #LBBTip: Child’s birthday coming up? Plan hassle free birthday parties here with friends & families for a fun day out over play and yummy food in a safe, indoor space and a huge variety of themes to choose from. Head to Let'emplay for non-stop fun and a memorable time with friends and family and lots of jumping, bouncing, playing, creating and learning! Earn those extra brownie points from the kids as they’ll be thanking you for days to come.